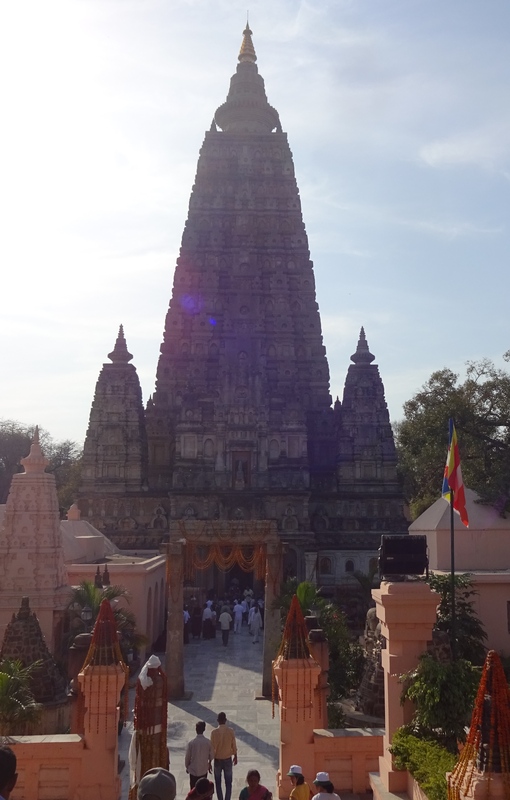 I had two hours to spend at the Mahabodhi Temple in the centre of Bodhgaya, India. It was only two hours because that’s when I told the hotel shuttle driver to return. But that was before I had any idea what was in store. 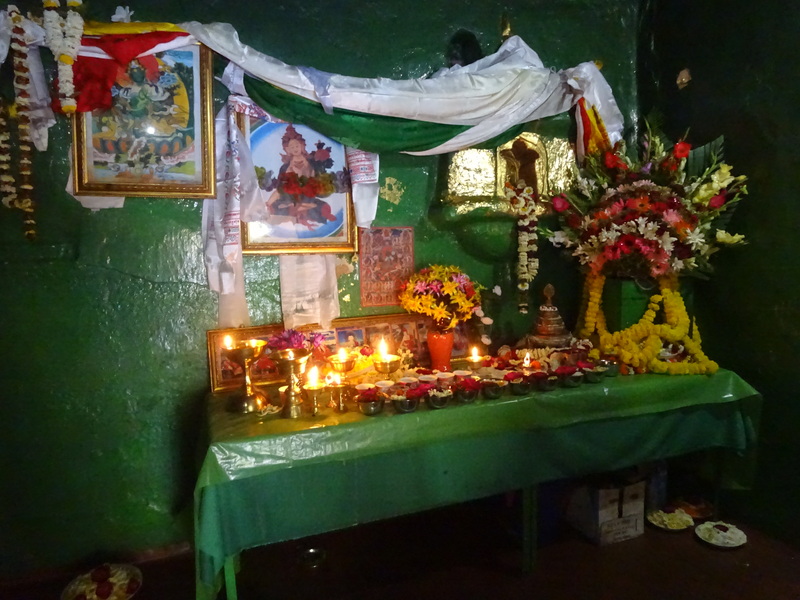 Yes, it’s large and yes, it’s crowded, but that’s because this is the holiest place in all of Buddhism, other than possibly Lumbini, Nepal, Buddha’s birthplace. 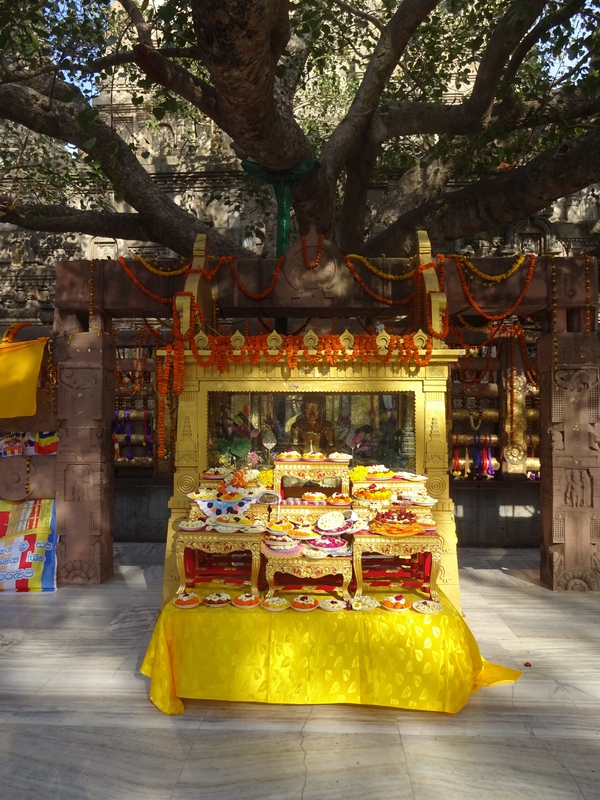 I was dropped off outside the gates on the busy main street lined with shops on one side and small vendors on the other, hawking religious objects and souvenirs. The street is a swarming mass of dust, tuk-tuks packed with passengers, ancient motorbikes, pedestrians, horse-drawn carts, tour busses and cars. 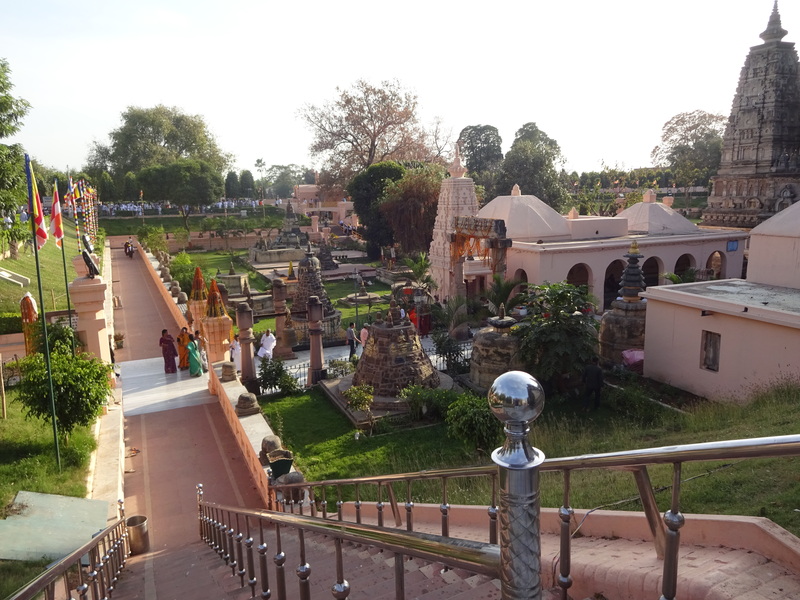 A continuous stream of visitors is entering and leaving this sprawling complex of small shrines, lawns, the main temple, walled sections on multiple levels, and of course, the Bodhi Tree itself, also protected from assault by the millions of human hands coming here to sample the spirit of this place, and that would touch it to death. They come in groups large and small, as individuals, families and congregants. They come from all nations, as monks and lay persons. They follow guides. They sit. They worship, they prostrate themselves. They seek peace, recite prayers around the main spire, sit quietly inside small niche altars in side buildings, on the lawns, overlooking the pond and in solitary walks around the perimeter. 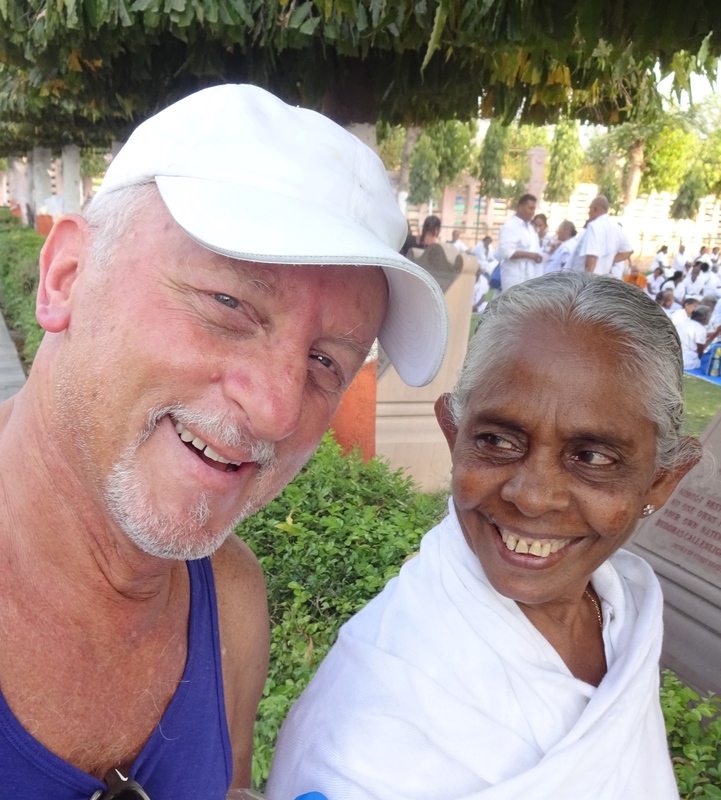 I had the feeling of being a novice amidst the devotion demonstrated all around me. 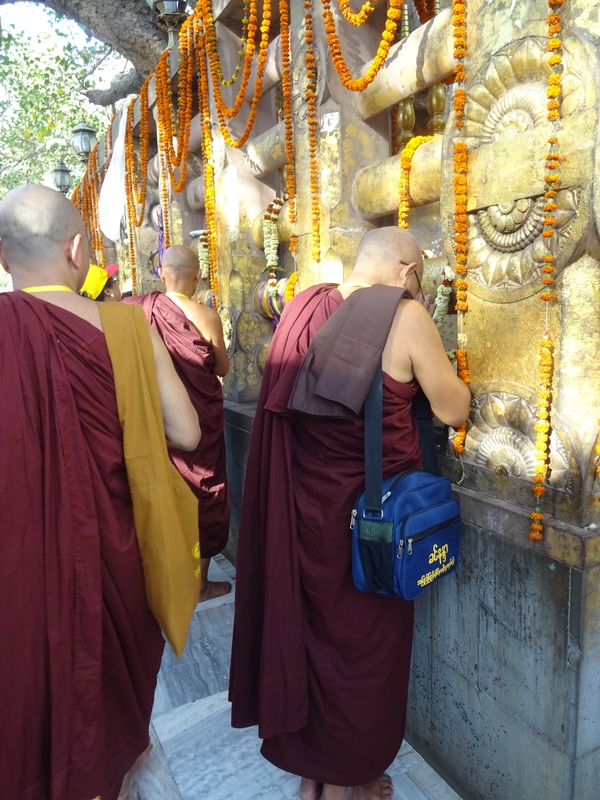 I looked into the faces of many monks, young and old, from all nations and denominations of Buddhism; some youthful, spirited, effusive; others, matured, resolute; still others, the lined and weathered faces of the elderly, working their malas as they circumambulate. 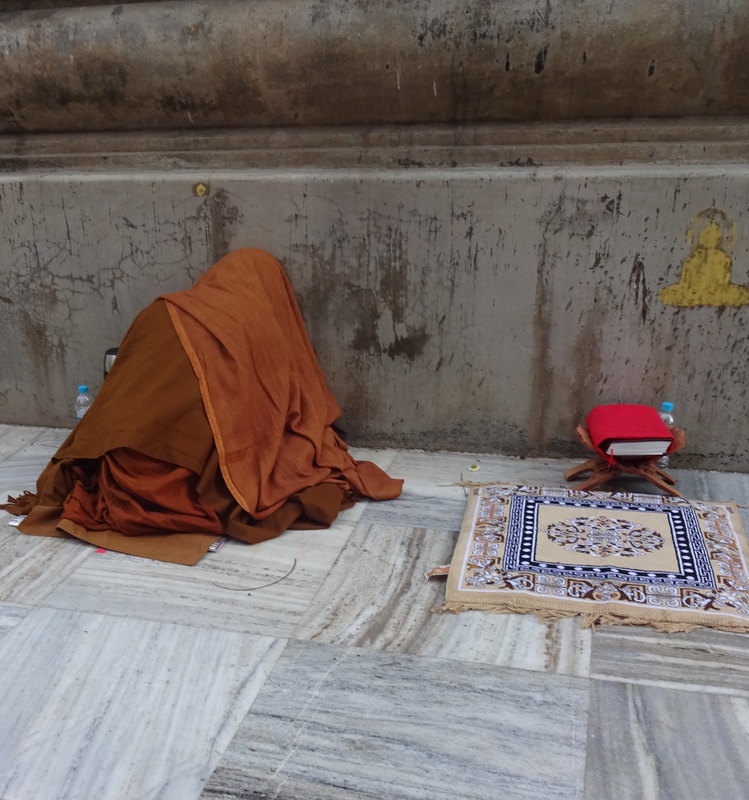 As I meandered further into the outer reaches of the complex, the Muslim call to prayer suddenly erupted from a mosque next door. I could see the spires through the trees but not the entire building. I was stopped in my tracks, chills running through my body. 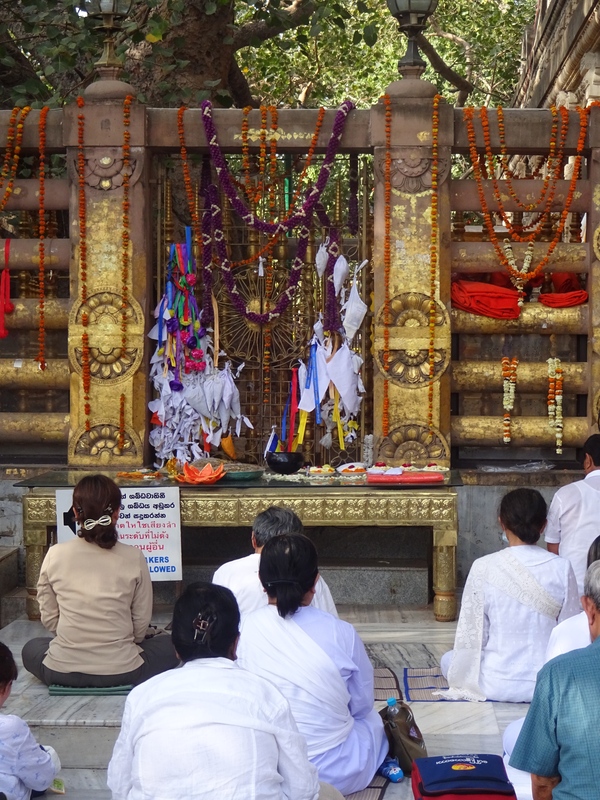 Here across the holiest place of Buddhism, to the ears of every supplicant came the strains of “Allahu akbar…, “…come to prayer, my brothers and sisters, renew your devotion once again to the One. 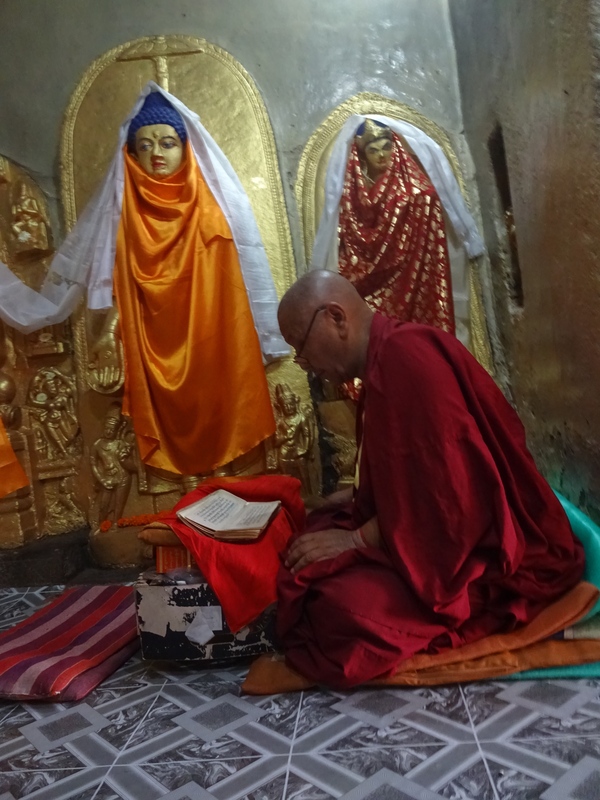 This Tibetan monk is performing the preliminary practices, including 100,000 prostrations, by wearing gloves, sliding pads on his hands, cushioning his torso on impact. 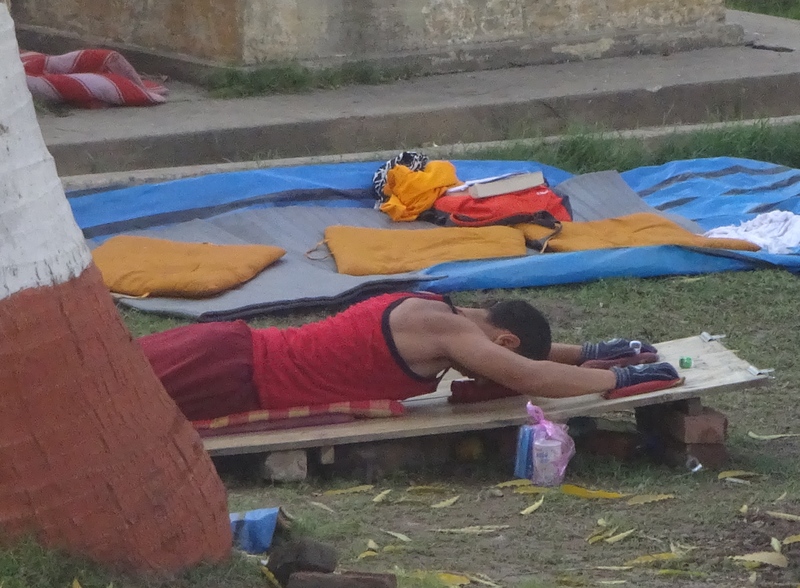 He was moving from a full standing position to full prone about 10-12 times per minute. No wonder those guys look so buff. Amiright? The name of God does not belong to anyone. It is not a secret owned by anyone. Wisdom has no face. It knows no name or tribe, no denomination or nation, no place, no single ritual. It has many messengers, but only one story. 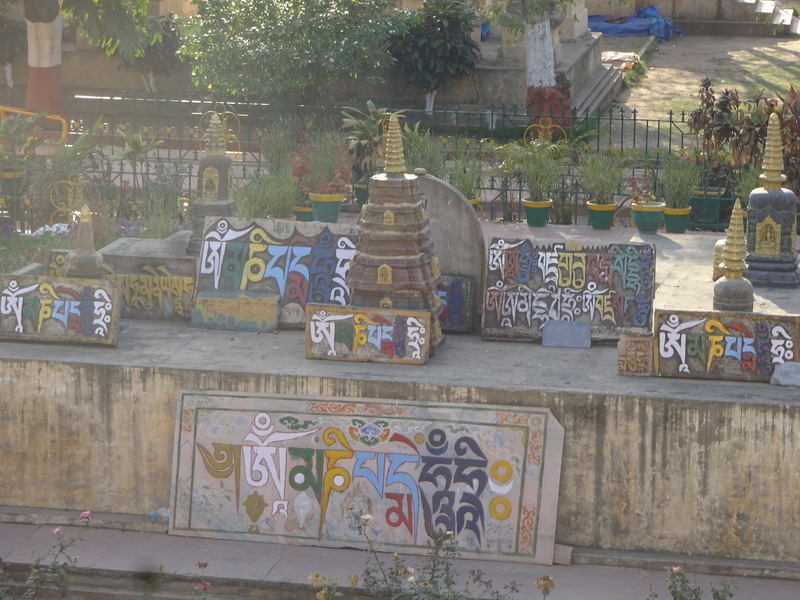 Unlike the internet here in Bodhgaya, there is no satellite. There is no weather. There is no faulty equipment or human error. No one owns the channel. The wisdom uplink is always working. 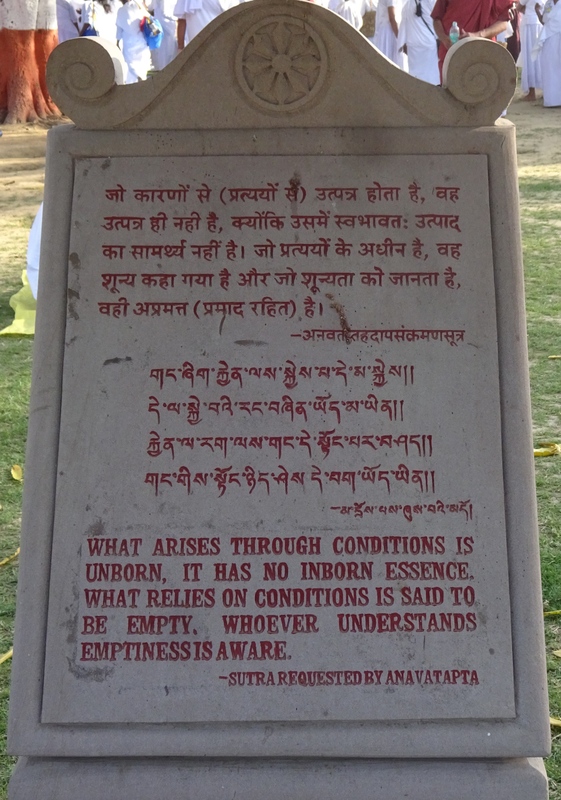 Floating back to my shoes, I was reading these inscriptions in stone all sponsored by the Thai government. 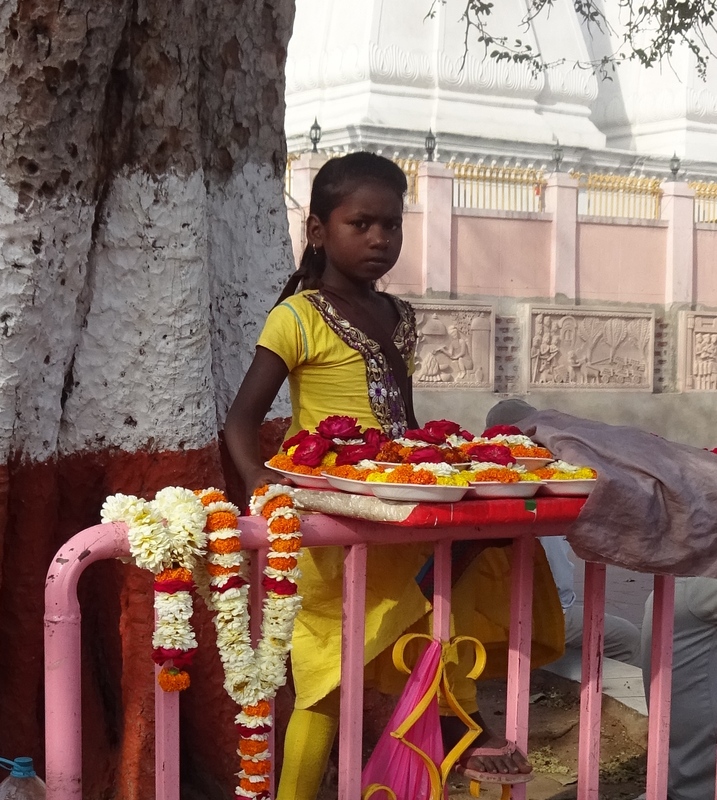 I encountered this woman standing beneath a tree. Our eyes caught, we smiled. Namaste. She had an exquisite radiance that could not be fully captured by a mere selfie, but perhaps you can get a small glimpse of it. 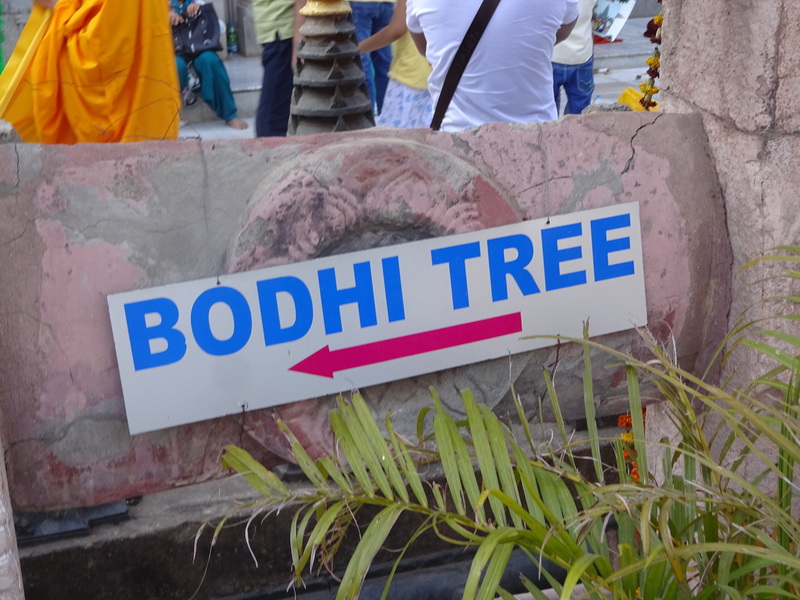 This entry was posted in Buddhism, Travel and tagged Bodhgaya, Bodhi Tree, Buddha tree, India holy place, Maha Bodhi Temple by garyhorvitz. Bookmark the permalink. Likely quite different 20 years later. But still…. Be very choosy about a guesthouse. One with its own restaurant may be safer. And wear a mask at all times. Didn’t start until the third day and it was already too late. ❤ to you.